EEEKKKK! Don’t be afraid of these creepy crawly creatures. Color then cut them out along the dotted lines. Count and glue next to the matching numbers. Trace the numbers. 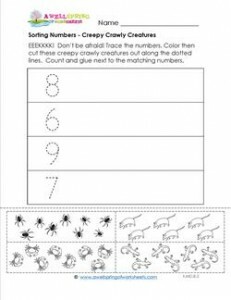 Please go to this page to see all the sorting numbers worksheets in this set.